The sternwheel packet boat CARRIE BROOKS chugged along down the icy Muskingum River one frigid winter day in the 1870's. Engineer Cliff Crane was on duty in the engine room. Passing the Douda bar (near Malta-McConnelsville, Ohio) Crane stepped out on the fantail to oil the bearings of the paddlewheel shaft. Spray from the paddlewheel left a coating of solid ice. He slipped and fell overboard. A potential disaster was unfolding. The Muskingum River is a tributary of the Ohio River. George Washington made note of it in his exploratory trip down the Ohio River in 1770. More than 200 steamboats plied the Muskingum River after its lock and dam system was completed in 1841. It was the first such navigation system in the United States. It provided access for rural Ohio to the Great Lakes and Atlantic Ocean by way of the Miami Erie Canal, to Pittsburgh up the Ohio River, and to the Gulf of Mexico via the Ohio and Mississippi Rivers. Crane floundered in shock from the freezing water, struggling to stay afloat in his heavy clothing. The CARRIE BROOKS steamed on without slowing, confirming what he already knew: the crew was unaware he had fallen overboard. He began shouting frantically for help as he struggled toward shore. Luckily, James Loughridge heard the cries and found Crane clinging to willows along the shore, exhausted. Crane splashed ashore and immediately began running to the Loughridge house. He was oblivious to his own situation, panicked that his absence placed the CARRIE BROOKS in danger. He asked if there was a horse available. He had to catch up with the boat before it was too late. Crane was the engineer on the CARRIE BROOKS. The steamboat pilots communicated with the engine room using a system of bells to change speed or reverse direction. The engineer upon hearing a bell, rang back an acknowledgement to the pilot and made the changes requested. Without Crane, there was no one in the engine room to slow the boat for docking. And Crane knew the boat would stop at Hooksburg, located just upriver of Stockport, about four miles downstream. Imagine the peril of a vehicle headed downhill at full speed with the accelerator to the floor and no brakes. 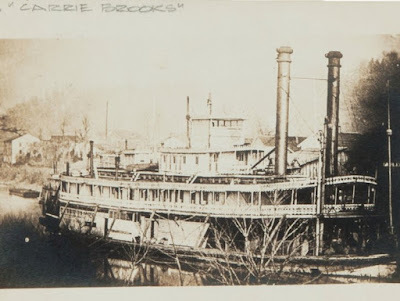 The CARRIE BROOKS was a steam powered sternwheel packet boat built in 1866 at Pittsburgh by the Darlington family of Zanesville. She was designed for the Pittsburgh-Zanesville "trade" (a riverboat term indicating the boat's regular routes) moving freight and passengers. At a reported 310 tons, she was one of the largest boats ever on the Muskingum River. The Pittsburgh-Zanesville route was a popular and profitable one for Muskingum River steam boats in the mid-to late 1800's. Many Ohioans in 1870 wanted fresh opportunities by migrating west, just as decades before people in the east had relocated the Ohio country. 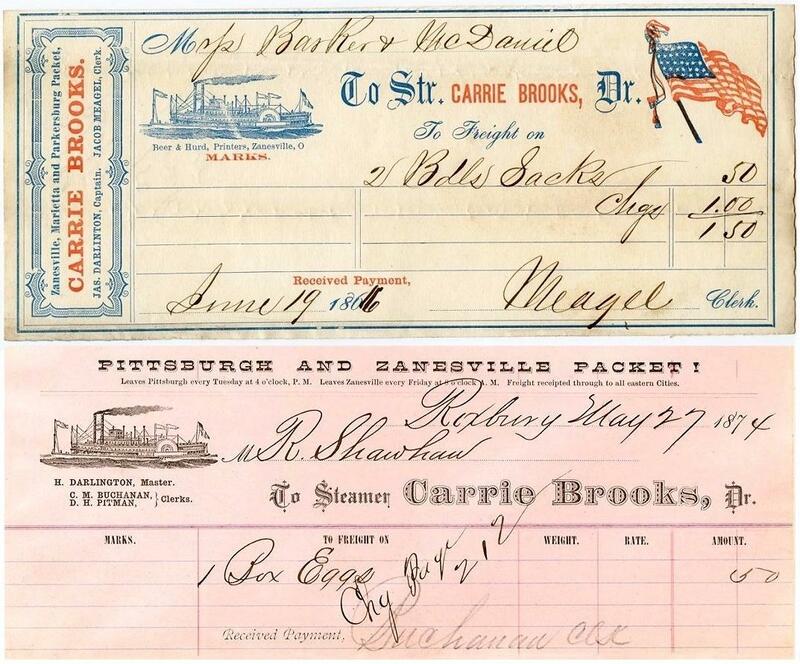 CARRIE BROOKS made a trip west carrying 140 passengers headed west to newly settled areas, such as Kansas. 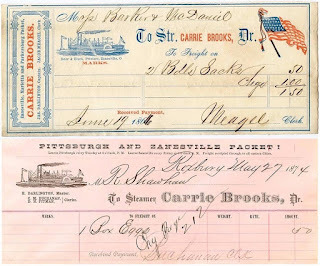 The CARRIE BROOKS went out of service in 1878. The CARRIE BROOKS pilot was vigilant as he steered around a bend in the icy river towards the dock at Hooksburg. He rang a bell to slow for docking. No answer. Anxiously he rang the stopping bell to stop engines. No answer. He realized no one was in the engine room and instantly steered the boat out into the river to avoid the dock. He "tramped" the pilot wheel by climbing on it to turn the wheel with his feet for maximum response. The CARRIE BROOKS bow veered away from the dock. But would the stern, swinging around with the boat still under full power, scrape the shore. That could damage the paddlewheel and immobilize the boat. It narrowly missed the shore. The crew realized for sure that Engineer Cliff Crane was overboard. The boat turned back up river to search for him. All eyes scanned the water and shorelines. They found nothing. With heavy hearts, they called off the search and continued down river. Meanwhile, at the Loughridge home, Crane was given dry clothes and a horse drawn carriage. The race was on to catch the CARRIE BROOKS. He caught up with her at Windsor Lock (now Stockport). The crew were amazed and overjoyed at seeing Cliff Crane whom they had given up for lost. Steamboat travel could be hazardous to boats, crew, and passengers. Boiler explosions, mechanical breakdowns, damage from obstructions ("snags") in the river, and collisions were all too common. The CARRIE BROOKS herself experienced mechanical failure and was damaged on the Ohio River when she struck a barge. Muskingum River sidewheeler BUCKEYE BELLE (built at Knox Boat Yard in Harmar and the largest such vessel to run on the Muskingum River) exploded November 12, 1852 near Beverly with an estimated loss of 40 lives. The previous day another Muskingum River boat DAN CONVERSE, which had alternated mail routes with the BUCKEYE BELLE, sank below Pittsburgh when it hit a log. In an ironic twist, DAN CONVERSE passenger R. L. Morris was returning to McConnelsville a few days later. His trip up river was halted by the wreckage of the BUCKEYE BELLE at Beverly. He proceeded to walk the remaining distance to McConnelsville and arrived in time to serve as pall bearer for BUCKEYE BELLE victim Milton Whissen. But that day on the CARRIE BROOKS, it was a happy ending. Tragedy was averted. There was no damage to the boat. Like the biblical story of the prodigal son, Cliff Crane was "lost but was found." Muskingum River place names mentioned are those in effect at the time of this incident. Names of steamboats are listed in all capital letters according to some traditions. Your author has chosen this method of listing boat names. Sorry, guys, but female pronouns are used for boats. Travis, Irven, “Navigation on the Muskingum,” Ohio Archaeological and History Quarterly, Vol XIV, pages 408-424, Columbus, Fred J. Herr, 1905. Travis, Irven, “Muskingum River Pilots,” Ohio Archaeological and History Quarterly, Vol XXVI, pages 477-488, Columbus, Fred J. Herr, date not noted.